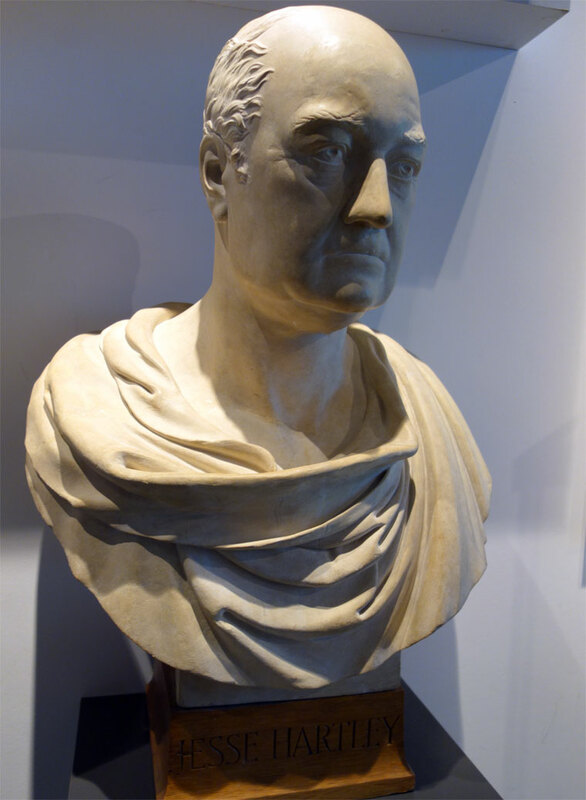 1825 Jesse Hartley, Engineer to the Liverpool Docks, became a member of the Institution of Civil Engineers. Jesse Hartley was born near Pontefract, Yorkshire, in 1780, and died at Liverpool in 1860; he was a man of ruddy complexion, a powerful bodily frame and robust constitution; and was of the old school of practical Engineers, in a great measure self-taught. His father Hugh Hartley was Bridge-master for the West Riding of Yorkshire, his brother Bernard succeeding the father, while his nephew Bernard Hartley, son of the above, is at this time Bridge-master of the West Riding. Jesse Hartley worked under his father in early youth as a mason; but from the age of thirteen he was partly engaged in office duties and partly on the works at Ferry Bridge, then in course of construction. Before he was fifteen he had visited Lancaster, and made sketches and memoranda of the then new bridge, by Thomas Harrison of Chester, and the new canal aqueduct, by John Rennie (the elder), over the River Lune. In 1811-12 he went to Ireland for the Duke of Devonshire, to complete the bridge at Dungarvon. Subsequently he became Bridge-master to the Salford Hundred; and in the year 1824 he was selected by the Liverpool Dock Trustees to be their Surveyor at an annual salary of £1,000. In the competition that preceded this appointment Mr. Jesse Hartley became acquainted with the late Albinus Martin, M. Inst. C.E., also a candidate, and the friendship thus formed extended to the son, and became firm and lasting through life. Mr. Jesse Hartley completed the Grosvenor Bridge, over the River Dee, near Chester, his consent to undertake the work being given, on the condition that no alteration should be made in the external design of the architect, Mr. Harrison, who from advanced age and declining health was precluded from taking an active part in the construction, but that the interior and all practical points should be left to him. 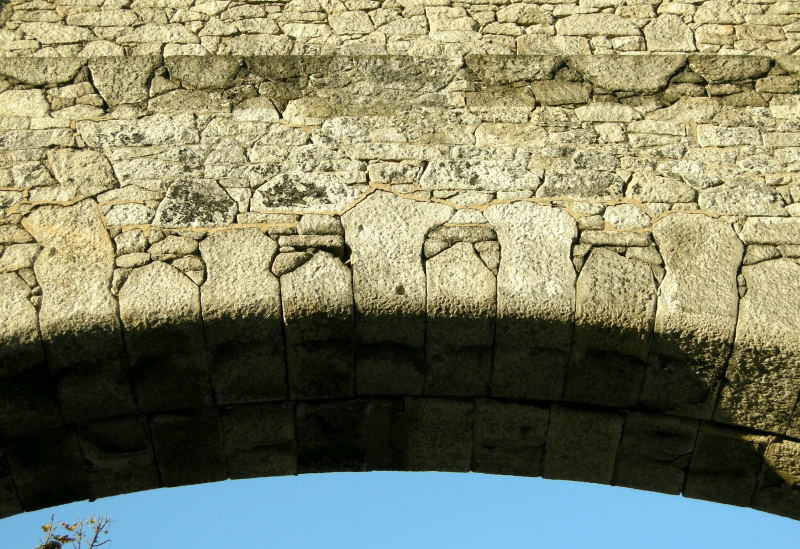 Under the superintendence of Mr. Jesse Hartley this bridge, with its fine stone arch of 200 feet span, the largest single-span stone arch in existence at the time, was completed in 1832. As a Dock Engineer, Mr. Jesse Hartley is admitted to have occupied a very high position. Possessing great natural sagacity, and imbued with an innate perception of the leading features of constructive design, he speedily acquired a profound, as well as an extensive knowledge of the requirements of that branch of science to which he devoted himself; and in the design and construction of the numerous docks of Liverpool, he has left monuments of his skill as an Engineer, which will endure as long as the fame and commercial prosperity of the port. The style of work introduced by Mr. Jesse Hartley was peculiarly his own. 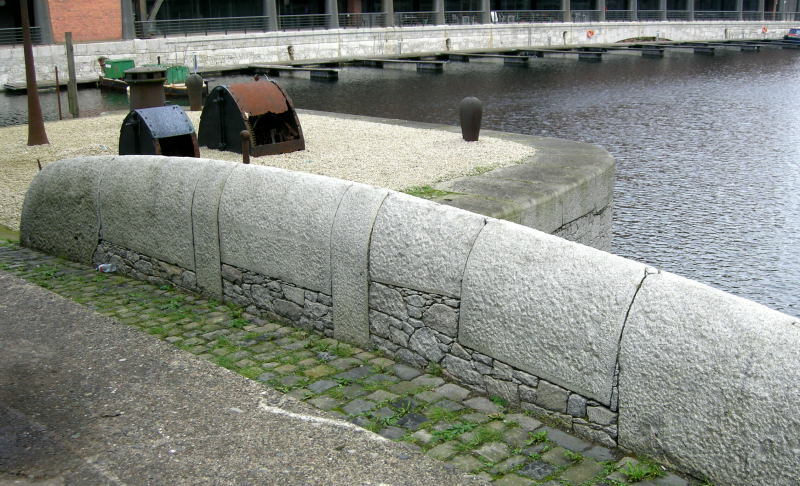 In the earlier periods he used Ashlar, dressed and worked to the greatest mechanical perfection; in his latter years rubble-work was adopted both for dock and river walls, with granite-rubble carefully jointed for face-work. Then the forms of construction adopted in the sills, platforms, and sluicing culverts of his dock-entrances, the dock-gates, bridges, fire-proof warehouses, shed-roofs, dock-buildings, and also much of his other work, had each a distinctive character, specially fitting it for the object intended to be served. The lighthouses and telegraph stations along the coast, from Liverpool to Holyhead, were under the control of the Dock Surveyors; and most of the buildings connected with the system were constructed by the Hartleys. 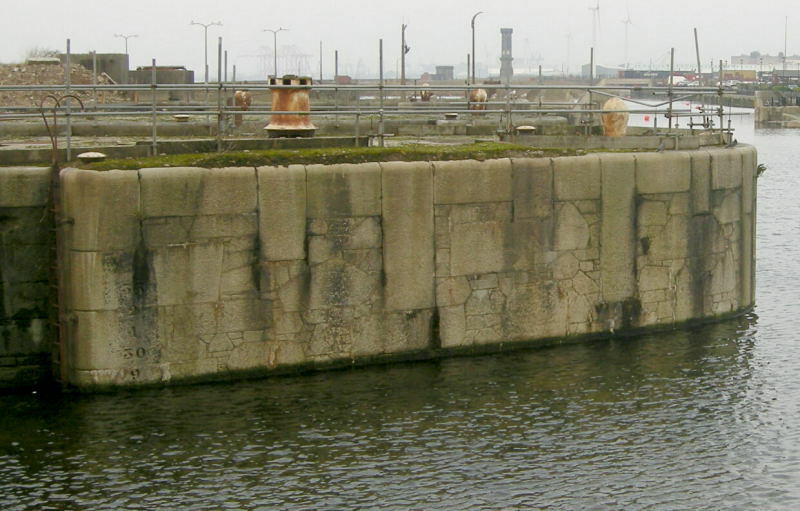 The area of the Liverpool Dock Estate, at the time when Jesse Hartley first entered on the duties of Dock Surveyor, was 123 acres, including a water-space of 70 acres in wet docks and basins. At the time of his decease the area of the water-space was 251 acres, and the entire area of the estate had been increased to 866 acres. The river frontage, which at the earlier period of 1824 was about 3,000 yards in length, had been increased by extension in opposite directions, north and south, to 10,000 yards. The tonnage of the port, which, in 1824, was 1,180,914 tons, amounted in 1861 to 4,977,272 tons, while the revenue from duties on tonnage and goods had increased in the same interval from £130,911 to £444,417. During this period of thirty-seven years, the whole of the Liverpool Docks, with the exception of the Prince’s Dock, had been built, rebuilt, deepened, or altered; and it is to the Hartleys, father and son, that the entire honour is due of designing, superintending, and carrying out this vast amount of engineering work. 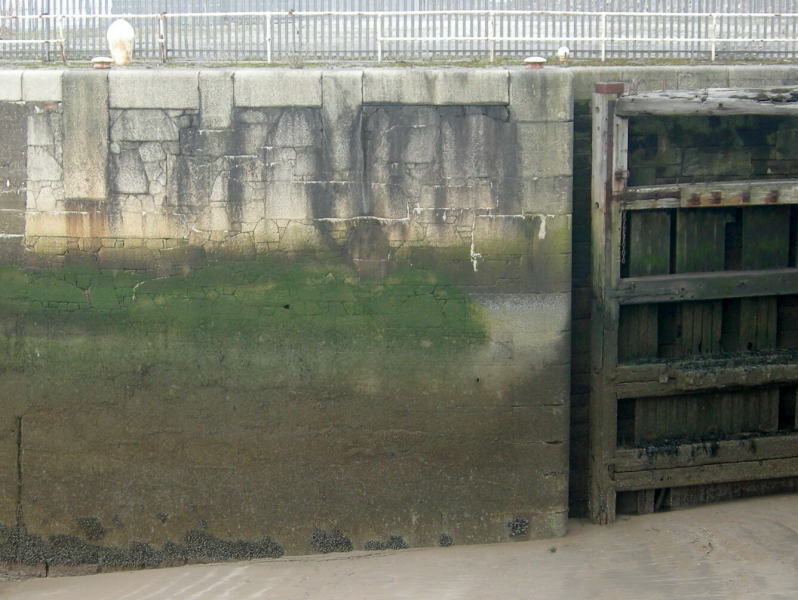 With the exception of the excavations, nearly the whole of the dock-extensions were executed by workmen under the immediate direction of the Messrs. Hartley. As the estate increased in extent, the superintendence of the repairs and maintenance alone added materially to the responsibility. For the last twenty years of Mr. Jesse Hartley’s life, the expenditure in new works on the Liverpool Dock Estate averaged £205,000 per annum, the highest amount being over £50,000, while the repairs and maintenance alone averaged £42,200 per annum, increased during the final ten years, owing to the great extension of the docks, to an average of nearly £62,000 per annum. The number of men of all grades employed at weekly wages averaged 1,650, ranging sometimes, in the busiest seasons, as high as 2,200. Thus, to the responsibility of the Engineer, in the Preparation of the designs for the intended works, were super added the onerous duties of the contractor for their execution. Mr. Jesse Hartley, however, would not give evidence before Parliamentary Committees; and neither father nor son published any work on the Liverpool Docks as designed and carried out by them, but only on the Chester Bridge. It was in opposition to the wishes of his father, who thought that the management of the Liverpool Docks was sufficient to occupy their joint attention, that Mr. J. B. Hartley undertook, in 1856, for the Corporation of Liverpool, as already intimated, the task of redesigning, with a view to ultimately carrying out, the Dock Works at Birkenhead. The annual contests the Birkenhead schemes had occasioned were nearly at an end; but it was not until the session of 1858 that the final plans, as designed by Mr. J. B. Hartley, were sanctioned by Parliament, and the works, as they were destined to be carried out, fairly commenced. Mr. Jesse Hartley had always steadfastly refused to be in any way connected with the Birkenhead project; and thus the whole of the new dock-work on the Cheshire side of the Mersey came under the sole superintendence of his son. How much labour and attention this involved will be understood when it is mentioned that the area of the Birkenhead (or Cheshire) Estate was 497 acres, and that the water-space intended to be formed into docks, and of which only about 7 acres had been hitherto constructed, amounted to 167 acres. The works, from their commencement, were prosecuted under Mr. J. B. Hartley vigorously, the system pursued being similar to that adopted at the Liverpool Docks. In a short time upwards of two thousand men were employed. The annual expenditure averaged £270,000; and for the year 1861, when Mr. J. B. Hartley retired, it amounted to nearly £350,000. But by this time Mr. J. B. Hartley’s health had failed him, and, acting under advice, he, in August, 1860, left England with the intention of spending the winter months in the warm climate of the Mediterranean. His father’s death, in the same month, summoned him hastily home again, to leave as soon as the arrangements consequent on that loss had been completed. Previous to his departure, however, the Dock Board appointed him successor to his father as Engineer of the Liverpool Dock Estate, at the full salary of £3,500 per annum. In May, 1861, he returned to England, considerably better, but by no means permanently restored to health. His old complaint, neuralgia, soon made its reappearance, and compelled him, in December of the same year, finally to resign his appointment as Engineer of the Liverpool Dock Estate, and retire from all the active duties of his profession. The Dock Board, not willing to sever the tie that had bound him so long and faithfully to their interests, appointed him their Consulting Engineer, at a retaining salary of £500 per annum. In personal appearance Mr. J. B. Hartley was of medium height, light hair and complexion, and, with the advantage of a superior education, possessed many of the best characteristics of his father. Immediately on quitting the Dock service Mr. J. B. Hartley left Liverpool, and went to live at Letrualt, in Dumbarton on Clyde, where, free from the ever-recurring toil and anxiety of his profession, he for several years lived in the enjoyment of the pure atmosphere of this sheltered home in the Western Highlands. His health, however, did not permit him to remain here constantly, as he would have wished; he was repeatedly compelled to seek relief at the Spas, in Switzerland, and other similar places of resort. In the autumn of 1869, shortly after one of his periodical visits to the Continent, he fell into his last illness, and, after much suffering, died on the 14th of December, 1869, and was buried in the churchyard at Stirling, on the 21st of the same month, the day of his funeral happening, by coincidence, on the anniversary of his father’s birth. Mr. J. B. Hartley was elected a Member of the Institution of Civil Engineers on the 11th of February, 1840. On the 23rd of June, 1840, a Paper of his was read, 'On the Effects of the Worm on Kyanized Timber exposed to the Action of Sea Water, and on the Use of Greenheart Timber from Demerara, in the same situations.' In this Paper it was shown that oak timber, whether kyanized or not, suffered equally from the ravages of the worm, whereas greenheart, in similar situations, that is, for clough-paddles, for sillpieces, and planking of dock-gates, remained untouched and perfectly sound. On the 18th of May, 1841, he also contributed a Paper, 'On the Formation of Embankments and the filling-in behind retaining walls,' wherein he described and recommended the method adopted by his father on the Manchester and Bolton Railway. The foregoing, with some observations on the system of pile-driving pursued at the Liverpool Docks, addressed to the Meeting on the l6th of April, 1844, comprise all that has been published of his communications to the Institution; and his absence from London, except during the busy Parliamentary season, and the close and constant attention he felt constrained to give to his engagements at Liverpool, gradually drew him away from attendance at the Meetings of the Institution. This page was last edited on 12 November 2016, at 00:02.